Let’s face it: for many people, the most annoying thing about owning a car is the time and effort it takes to keep it looking good and running smoothly. All too often, getting your car serviced, cleaned or repaired means either taking time away from work or sacrificing your weekend to bring it into the dealership, car wash or body shop. Carvoodoo provides a simple alternative: they pick your car up, bring it in to be serviced and return it to you when the work is done. Launched in 2017 by three Vanderbilt graduates who know first-hand how much of a pain it is to waste time in a dealership waiting room or line at a car wash, Carvoodoo was built to make your life easier. Whether you need your car cleaned, repaired, inspected or just serviced at your preferred dealership, Carvoodoo has you covered. With Carvoodoo, getting your car serviced, repaired or cleaned is as quick and easy as ordering groceries from Instacart or dinner from Postmates. 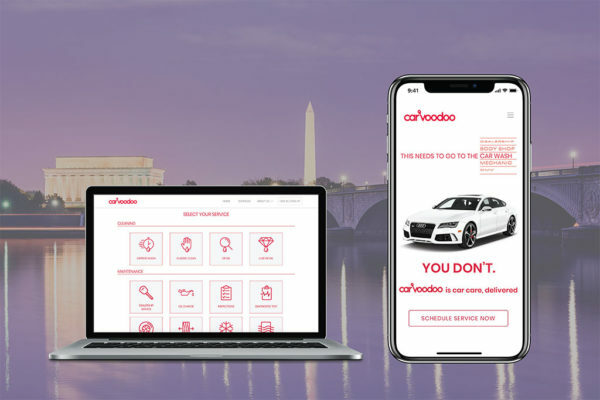 Once you’ve created an account on carvoodoo.com on your desktop or mobile device, you can schedule a service with a few taps or clicks, and Carvoodoo will handle the rest. Their crew members will make the arrangements with a trusted service provider, pick up your vehicle, take it to be serviced and ensure the work is completed satisfactorily, keeping you updated on your vehicle’s status throughout the process. When your car is ready, a crew member will return it to your home or office, or any other location of your choosing. In addition to saving you time and effort, Carvoodoo takes the guess work out of car ownership by negotiating parts & labor costs on your behalf and providing a layer of quality control, so you can be confident that the work done on your car is priced fairly and completed properly. Book now and get 15% off your first order with promo code POPVILLE15.